Various prototypes were made, some of which are now in the Alan Bates collection. 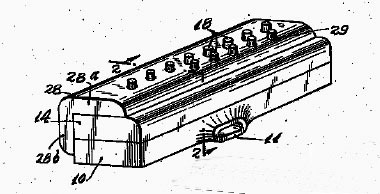 One 13-key version was called the Mellochord and was planned to have brass reeds made by the William Kratt Co. One of them was made for Johnny Puleo, but the instrument never went into commercial production. Due to various reasons, most notably cost of production, the only version that was actually marketed was the red plastic one shown at the top of the page (they were apparently available in other colours, but I have only ever seen the red ones). Instead of keys, it had fingerholes. Uncovering a fingerhole allowed a particular pair of reeds to sound (one sounded by blowing, the other by drawing), although I have to say that the motion feels a little unnatural. Instead of brass reeds, the reeds are of plastic, injection molded in one piece with the reedplate. There are eight fingerholes, giving a two octave diatonic range. The layout of notes is essentially the same as a solo tuned harmonica - hole one has a blow C and a draw D; hole two has a blow E and a draw F; hole three has a blow G and a draw A; hole four has a draw B and a blow C; holes five to eight repeat this pattern one octave higher. An instruction booklet was available that was endorsed by the well-known harmonica player Eddie Manson. The earliest ads for the Harmonichord give a price of $2.00, but later ads show that the price had dropped to 59c. Whether this was the result of improved manufacturing processes, or because nobody was willing to pay two dollars for them, I can't say.